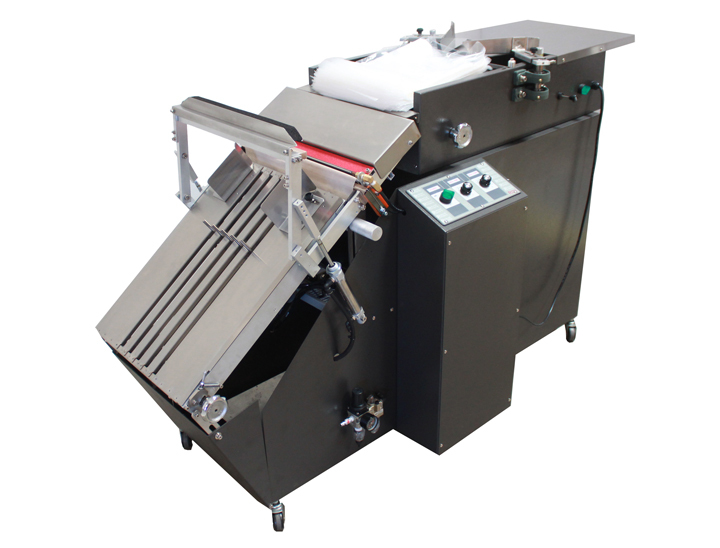 Gravity Slide “Drop” Sealers are high speed stand alone bag sealers. They come as either thermal impulse sealers (for extra strong sealing) or as constant heat sealers for higher speed sealing. The Preferred Pack Drop Sealers are capable of sealing up to 25 bags per minute. Eeach drop sealer comes standard with a trim wire and scrap blow off. As the operator loads the product through the entering guide arms it drops it into the gravity slide sealer section of the machine. Holding pins stop the package’s downward travel. An electric eye sensor signals the sealer jaw to close. The seal wire is energized, effectively sealing the bag opening and trimming the excess bag scrap. A kicker plate severs the excess material above the seal, which is blown away by a short blast of compressed air. As the sealer jaw opens, the holding pins retract. The finished package slides down off the slide rack. The holding pins return, ready for the next package. An optional incline takeaway conveyor can send your package down the assembly line for further production or loading. All product contact parts are stainless steel making it suitable for a wide variety of applications. Options available for the Drop Sealer include double line seal (separate flat ribbon seal wire and heated trim wire), product compression attachment (for flattening the product & bag before sealing), comes standard with casters for machine portability, wider jaw opening for larger products. Adjustable Table Depth and Angles to acoomodate most Product Sizes. 402 Series Bag openers feature a 110-volt high pressure air blower system, air volume control, stainless steel guides and entering arms. Works with wicketed bag up to 20″ wide and up. The air blower system opens the bag for fast and easy loading of the products. The Series 402 has a capacity of 200 bags. he Preferred Pack Series Bag openers feature a 110-volt high pressure air blower system, air volume control, stainless steel guides and entering arms. Works with wicketed bag up to 20″ wide and up. The air blower system opens the bag for fast and easy loading of the products. The Series 402 has a capacity of 200 bags.